How much can you over-radiate and still get a perfect image? 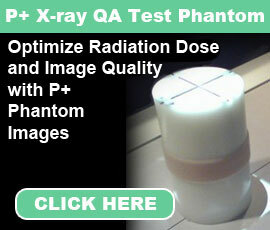 Without a phantom it is almost impossible to see how easy it is to over-radiate a patient and still have a perfect (or at least very passable) image. I have now been able to use my skull phantom on nine different manufacturers to discover how much mAs can be used (over-used) before the image is unusable. Currently I have four CR and five DR vendors. In my two-eight hour presentations I use five to eight lateral skull images for each vendor. As scrolling through the images on this page is a bit cumbersome, I have put the four most important images from each vendor together as a 4 on 1. From the research I have performed, all of the CR manufacturers except Agfa have the ability to “fix” an exposure that has been over-radiated by more than 50 times (see images 1-4). That is automatic rescaling at its finest. Just to put that in perspective of what we could do with film, (see image 5). The .5 times more mAs film would have been slightly dark but still good, the 2 times more mAs film would have needed a hot light to be read properly and the 3 times more mAs film would have gone straight into the repeat bin. Again, these new digital CR exposures can use over 50 times too much mAs and still be almost identical to the perfect technique. Agfa, on the other hand, only allows about 8-10 times too much mAs before the image has permanent burn which cannot be rectified (image 6). None of the DR detectors have the latitude of CR (thank goodness!!). They are somewhat in the Agfa zone. I have found that depending on the specific detector the DR images will have burn or some other unacceptable “distortion” when four to sixteen times too much mAs is used (images 7-9). The new wireless detectors by Carestream and Canon were the ones that could handle the sixteen times over-radiation (images 10-11). This is why it is impossible for anyone to be able to look at a monitor and tell if the patient was over-radiated, unless enough radiation was used to create burn on the image. It is also why the EI numbers are the only way a radiographer can tell if the technique was correct. Thank you Dennis for giving us a tour of your website. I am delighted to have met such a cool and smart man! Your research is what I will use for my radiology class here in San Joaquin Valley College in Fresno!